Hi friends, I have another makeup post to share with you today. I recently went shopping at the MAC makeup store and treated myself to some makeup. I really love wearing lipstick, so I purchased a lip pencil and lipstick that I would love to share with you. The lip pencil is MAC Pro Longwear Lip Pencil in the color - In Anticipation. This is a lip pencil in a light pink shade, it goes on smoothly and has 8-hour wear, a rich color and transfer-proof. The price is $20. I chose this light pink lip liner because I thought that it would go with a lot of my lipsticks that I already have. It goes on smoothly and even looks pretty without wearing lipstick. 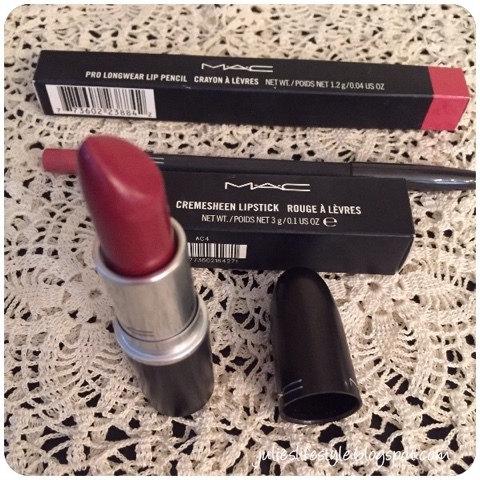 The lipstick is MAC Cremesheen Lipstick in the color - Party Line. This is a dark rose color, it comes in 10 shades, and has a creamy texture. The price is $17. I love this color lipstick for fall and winter because it's a darker shade and it really lasts a long time on my lips without coming off. The link to MAC cosmetics is Here. You can order this online if you can not get to the store to buy it. I like the lip pencil and lipstick paired together and they both lasted a long time without coming off and there was no bleeding from the outside of my lips. I would recommend these if you feel like splurging a little on makeup. Do you have any favorite lipstick that you like? I would love to know! If you missed any of my makeup posts you can see them all HERE. I hope I have inspired you to go shopping this weekend and buy a new lipstick. Wishing you all a lovely weekend. See you all on Monday for Cooking and Crafting with J & J Link Up and Features. I'm really bad with lipstick. I need to use it more often. I usually put it on once and forget it . My daughter has a lot of MAC lipsticks that look great on her. I should try one! I love lipstick, Julie. I won't leave the house without it! I have never tried MAC, looks pretty. That lipstick color is perfection. I may have to "steal" it!! I love MAC! Did you know that if you turn in 8 empty MAC containers of any kind, you get a free lipstick? Even though I am not a lipstick girl, I still like that idea. Have a great weekend! I really enjoy your makeup posts, Julie. I rarely wear lipstick but when I do it's generally pink gloss - cover girl or revlon. I often just apply a bit of petroleum jelly. Thank you for the tip on the long lasting lipstick. Mine wears off right away. I've only been in a MAC store once and it was packed...I didn't know you could get things online from them. I buy this lipstick all the time, after you tried then you dont want any other label. The ones I always buy are: Taupe,and Morange this particular one has a phosphorscent color and glow in the night, and during the day is so rich and beautiful. My next buy will be Viva Glam a beautiful red. Love Mac!!. Hi Julie, That is one of my favorite shades of lip color. Love it. I always use a lip pencil before my color. It really helps to keep it in place and from fading. Thanks for sharing. Have a great weekend sweet friend. Love your choice and this suits me since I hate striking color.. Pretty color - I think it might be a good shade for me, too! I have one MAC lipstick, and love it. Just bought a Rimmel lipstick in a really pretty color, but the quality just isn't the same. Lipstick treats are the best Julie! That color is beautiful. Enjoy! I love MAC makeup. It is great quality with reasonable prices. I also love Kat Von D lipsticks. They are long lasting too. Thank you for linking up with Friday Favorites! My 19 yo daughter is kind of obsessed with makeup. We went to the MAC store in Vermont last month & I bought my first MAC lipstick & it is my favorite! My daughter also loves Kat Von D. She couldn't wait for the new colors to come out! Such pretty shades you've chosen, Julie. Lately, pinks seem to be getting my attention, which is a little weird, since I'm stuck on reds. I love MAC cosmetics and the colour of the lipstick and lip pencil are one of my favourites. Thanks for sharing this with us at #AnythingGoes link up. What a beautiful color, my friend! I tend to only wear chapstick, but if I do wear color it's usually something like this or a fun coral color. Thanks for sharing with Roses of Inspiration. Hugs! I have heard great things about MAC, Julie. That is such a beautiful colour lipstick and the liner compliments it beautifully. They are perfect for the new fall season! Thank you for sharing this post with us at Hearth and Soul. I love the color of Lipstick, going to check out . Thanks for sharing with Hearth and soul blog hop, tweeting.